As a word of the year Gratitude was a good one. I am grateful for the experience of 2017. Creativity is slowly returning. The Quilted Block of the Month Started (with big plans to continue in 2018). A few teaching opportunities. Learning about embroidery. Having a spouse who loves me deeply. Over the last two weeks I’ve started looking at 2017 as it comes speeding like a race car to the end of the year. Here we are on December 14th. Where on earth has this year gone?! Are there new goals in place? Am I actively taking part in the quilting career in meaningful ways? What about my creative life, is it being nurtured? In the middle of all of this thinking I started thinking about 2018. What will be the Word of the Year? What are the quilt related goals? The other day I chatted with a very good friend wondering what 2018 would hold. The Word of the Year was part of the conversation as looking at 2018 is a bit of a puzzlement. Kind of like looking at the collected work of fabric on the shelves, wondering what delightful quilt will be made from the color and texture contained therein. I started thinking about stitching fabric together, it is connected with needle and thread, ideas, and a willingness to cut into it. The thoughts continued with the machine quilting, how the top, batting(s) and back are connected, once again, with needle and thread. One stitch connecting to the next. It’s a great word. And with the Word now in Focus the ideas for the next several Quilted Block of the Month came into focus. One block I cannot remember the name for the life of me will make an appearance in January or February. Then I started thinking of a Double 9 Patch, and a Double Wedding Ring, they are on the list, and we’ll see what happens as the list goes up on the Wall of Inspiration. Connecting with You is as important to me. If you have a favorite block please let me know the name, allowing me to add it to the list of possibilities. And let me know if there is a thread you would like me to talk about, sharing the way I’d set up my machine to use that particular thread. I’m off to Connect with tidying up my sewing room. Watch Instagram later for some pics. 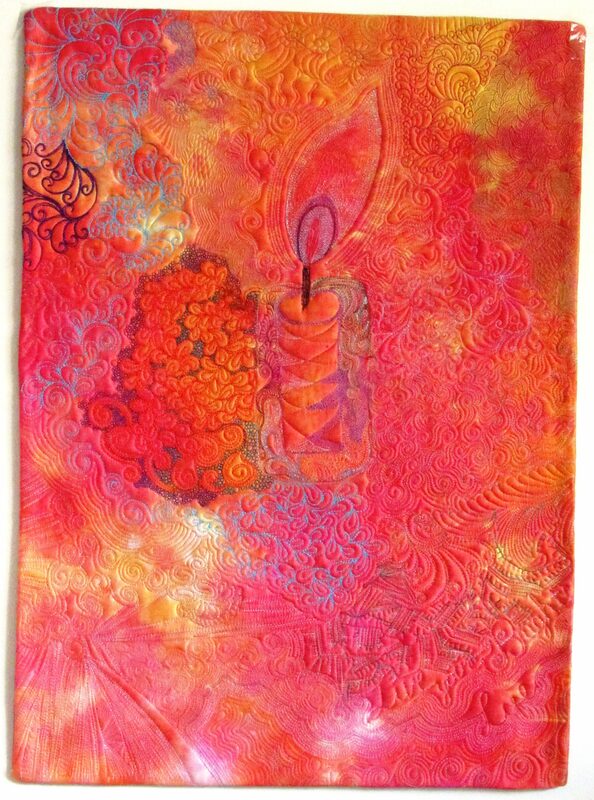 I’m teaching at the Quilt Basket in Pawling, NY Saturday January 20th. The class fee includes a kit. Just bring your machine, and be ready for a day of getting the stitchy stuff from your brain to your quilt top. I think we’ll start out with the bones for a tree. Hi Teri. “Connect” is a good word and sounds like it suits your goals. I am still pondering mine, though I’ve probably hit on it already. Thanks as always for sharing part of your life with us. Merry Christmas, and happy connecting year! Thanks Melanie, I look forward to your word. Each word chosen is interesting, and living it even more so.